M&H Racemaster Front Runner Drag tires are light weight tires that offer reduced rolling resistance that will give you the edge against the competition. 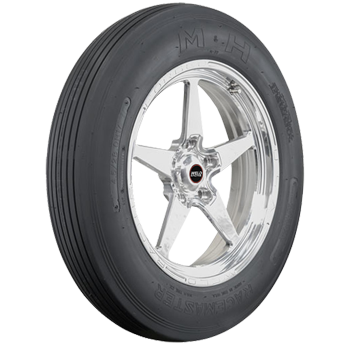 M&H Racemaster Front Runner Drag Tires are available for 15”, 16” and 17” front runner wheels. M&H Racemaster Front Runner Drag Tires are mainly bias ply, but Radial front runner tires in select sizes are also available. M&H Racemaster engineered the first purpose built drag racing tire the 1950s. M&H Racemaster still makes highly competitive tires for multiple drag racing and street applications that are Made in USA!